Monster cookies were my kids favorites at one time. Now I'm making them for the grands and sometimes I even have a little helper in the kitchen. 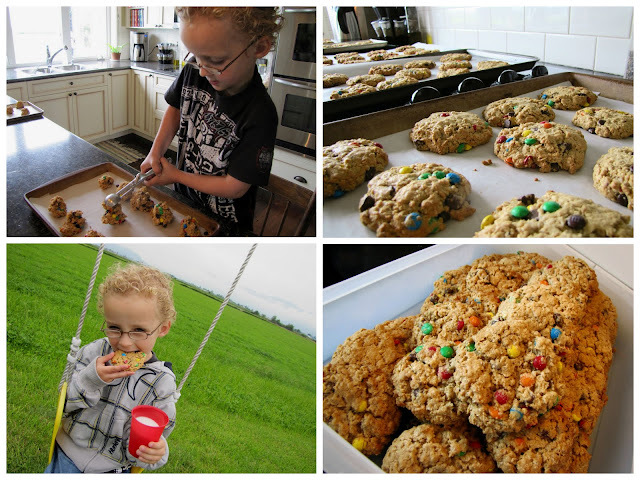 They are a large peanut butter oatmeal cookie and are safe for those on a gluten-free diet if you use gluten-free oats. Drop by rounded tablespoon onto greased cookie sheets...or lined with parchment paper. Bake at 350°F for 10 minutes...do not overbake. Wait for several minutes before removing from pans. 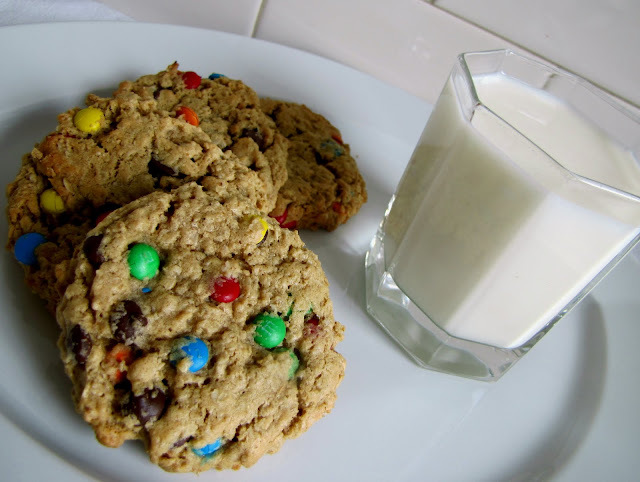 *I prefer the baking M & M's, but the larger ones work as well. Be sure to recruit a little cookie monster to help with the entire process! Recently the power of prayer has been impressed on my mind. It is easier to take note when huge things happen in our lives and we see God's answers to our prayers but we know that God is listening to our hearts even in the little things. When we pray in faith God does hear and answers in the best way for us, when He doesn't always answer according to our plan we tend to think it's unanswered prayer. I want to share how He answered my prayer 'in a little thing' in a way that left no doubt that He heard me. A number of years ago my husband was out of town on a business trip and I was home by myself. As I got ready for bed that night I felt a great fear come over me. I grabbed my Bible and opened it at random to James 5:16, the last part of the verse assuring me that 'the prayer of a righteous man is powerful and effective'. I picked up The Daily Bread, a devotional book and the devotion for the day was based on James 5:16. I got goosebumps and felt God's peace flow through me. After spending some time reading the Bible and praying I was still in awe of how God had sent this verse to me twice. I picked up a novel that I was reading and a few pages in James 5:16 popped up again. I smiled and said 'okay God I get it'. Coincidence? No way, there is no doubt in my mind that God heard me and took the fear from me. I had peace. Let's remember to pray for each other and trust God for answers in the little things as well as the bigger ones. I got this recipe from my mother in law, I used less sugar than she did and found they tasted just as good. They have a chewy texture and a hint of spicy flavor. She claimed they tasted best right out of the freezer. Either way I find them delicious. There is no butter or shortening in this recipe just in case you thought I forgot. 1. In a bowl mix molasses, corn syrup, sugar, eggs, and lemon juice until well blended. 2. In a separate bowl stir together 1 cup flour, baking soda, ginger, lemon zest, and combine with the mixture in the first bowl. Then add more flour as you need. I used 3 cups in total. 3. Separate the dough into 2 parts and shape each part into a roll. 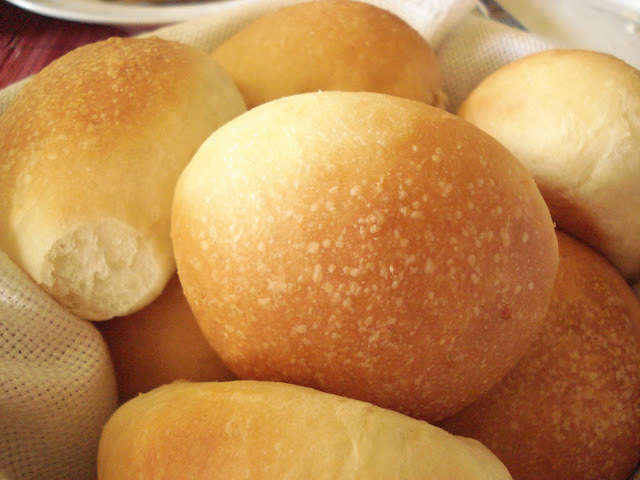 You may need a little extra flour as you shape the rolls as the dough tends to be a bit sticky. Wrap in waxed paper and freeze. 4. Remove from freezer and slice the rolls into approx 1/4 inch slices and bake in a 350º oven for 8 minutes. 5. Cool on rack. Spread jam between 2 cookies. I prefer wild plum jam. This is a quick way to dress up a vegetable. I think it would be good with cauliflower or asparagus as well. Steam desired amount of broccoli in microwave. Prepare topping by cutting 2 or 3 slices of bacon into 1/8th inch pieces. Fry in pan until crisp. Remove all but about 1 tablespoon of bacon fat from the pan. Add 1/2 cup dry bread crumbs or Panko bread crumbs to pan. Sprinkle topping over prepared broccoli. Traditionally this is a Christmas cookie, but our family loves them when we have gone camping, sitting around the fire on cool evenings. Oma makes sure that the family is always well supplied, since camping season is finally upon us our freezer is stocked. We thank you Oma. Refrigerate over night, the dough is very soft and sticky. Roll out dough on floured counter in small amounts, dough is sticky so it is easier to handle in small amounts, and cut in desired shapes. Bake at 350 for 10- 12 minutes. Cookie should be white on top and light brown on bottom. Glaze with a little icing sugar mixed with milk. * Baking ammonia can be bought in German deli's or specialty store. How many times have we been told something can't be done and then someone who didn't know it couldn't be done --- just went and DID IT !??? Near me is a bakery, the owner of which is an unpretentious man who had not heard that gluten-free bread could never be the same as wheat bread -- so he developed a method by which he bakes bread that NO ONE could tell the difference from regular wheat bread. I don't think he'll mind if I tell his story, as he told it to me. He was raised by his grandfather who was a baker, so a bakery kitchen is 'home' to him. A few years ago he was at a BBQ picnic and his little godchild was sitting on his knee. The hamburger bun was missing from her plate -- she was Celiac. Turning a little pouting face up to the man holding her on his lap she whined plaintively, "Can't YOU make me some bread?" It became his mission -- to make a gluten-free bread that was BREAD, not some rice cardboard at worst or an imitation at best. His goal was perfection ! It took him a year and a half - but he did it !! I tried to tell him that he had done what was declared to be impossible -- that he had done what no one else had ever done !! He shrugged, smiled and said he had no idea - he never goes on the computer. And to my suggestion that he could get rich just making that bread and distributing it, he replied he'd rather sleep. He has two kinds of gluten-free bread in his bakery -- potato/flax seed bread and onion bread. 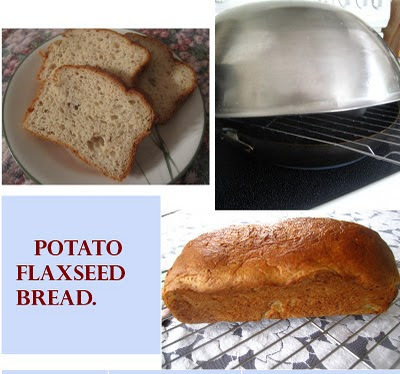 Both are good but the potato/flax seed is my favorite! He also makes buns and other gluten-free products. Since tasting his bread, I threw out the notion that gluten-free bread cannot be perfect bread and I have been experimenting taking into account a couple of tips he threw out. I'm not sure exact conditions can be duplicated in a home kitchen but I'm determined not to stop until I get at least close. 1/4 cup white corn flour + 1 rounded tsp. and beat on high for 5 minutes. 3.Scrap into a mid size greased loaf pan and smooth top with a wet hand. 4.Cover and let rise until at least doubled in bulk - it rises quickly. Take your biggest frying pan and almost fill it with water... bring to a rolling boil on the stove top, cover it with a wire rack.... and put the pan of risen bread on top of the rack... Cover the bread and the frying pan with a large metal mixing bowl. Let it steam for 7 minutes. Remove the bread pan and immediately put it into the pre-heated oven to 350'. 7.Remove from pan and let cool on rack. Chicken Cordon Bleu was one of the first dishes I had that I considered quite fancy. It's funny how nice dishes get their turn for a season and eventually others come along. Still, I want to say that making a stuffed chicken breast dinner never is out of style and this method can easily be made on cookie sheets for large groups. Whatever filling you choose, the method is the same. If using frozen chicken breasts, thaw in fridge overnight. The next day, put in Ziploc bag and flatten the inside side of the breast with meat hammer. Place in bowl and cover with milk until ready to use, at least a few hours, to tenderize. Mix cream cheese, spinach and pesto. If using fresh spinach, steam in boiling water for a few minutes, drain and cool. Combine crumbs and seasonings in small bowl. Tuck in sides as well as possible and roll up, then place on parchment paper lined pan, seam side down. It's a bit messy and feels like it won't hold together, but it does. Once all the breasts are done, sprinkle generously with seasoned crumb mixture and drizzle with melted butter. For the traditional method, with ham and cheese, I follow the same procedure, but for the filling I completely wrap a piece of cheese in a thin slice of ham. White cheddar works well. Again, I tuck in the sides as well as possible, and roll up as tight as I can. Once it's on the pan, it won't move. And the nice thing is, you put it in the oven and the work is done. A simple vegetable or salad and maybe some wild rice - your fancy meal is done. Have you noticed the beautifully covered book on our sidebar? 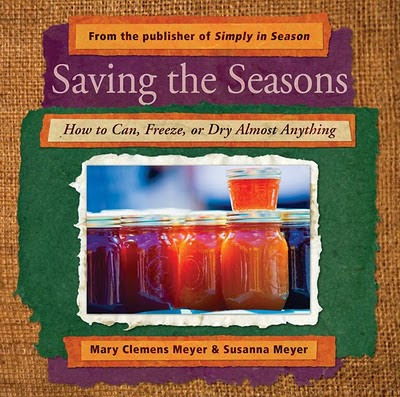 This last week I read through my own copy of Saving the Seasons and have enjoyed browsing the recipes. I appreciate beautiful food photography and I've been admiring the attractive photos of the fresh from the garden bounty and creative displays of preserved foods. Saving the Seasons is a brand new book published by Herald Press. 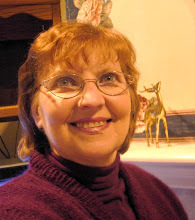 It is written by Mary Clemens Meyer and Susanna Meyer a mom and daughter team. Together they have taken a step by step approach to preserving locally grown foods. Spring is the perfect time of year to go through your freezer to use up the berries, fruits and veggies from last season to make room for this years produce. I found one last package of frozen strawberries. . .allowed them to thaw and then used the strawberry jam recipe in the Saving the Seasons. Making a batch of jam is so easy. . .
and so quick. . .
and the aroma in the kitchen will make your mouth water. I have my book marked for the summer recipes I want to try. To order your book and to learn more about what others are saying about Saving the Seasons published by Herald Press. . . If you get started early in the season and take advantage of fruits and vegetables when they are at their peak at your local farm market. . .you'll save both money and time later on. Nothing can match the flavour of home preserving. Saving the Seasons has valuable tips that making your home canning and preserving a success. While I was in the section on drying foods, I remembered that somewhere up in our attic is a food dryer and I'm wondering now why its been up there for so long. Years ago it was used to dry bananas, plums and apples and this year I plan to add tomatoes for their Sun Gold Tomato Mayonnaise. Wash, stem and crush strawberries. Measure exact amount into a large cooking pot. Into a separate bowl measure the sugar. . .exactly. Stir pectin into the pot. . .add the butter. Bring to a full rolling boil that doesn't stop bubbling when you are stirring. Quickly stir in sugar and boil exactly 1 minute. . .stirring constantly. Remove from heat and skim foam from the surface of the jam. Use a 1 cup measuring cup to fill your jars. . leave a 1/2 space. Apply lids and tighten down. I always allow to cool completely and then keep them in the freezer. 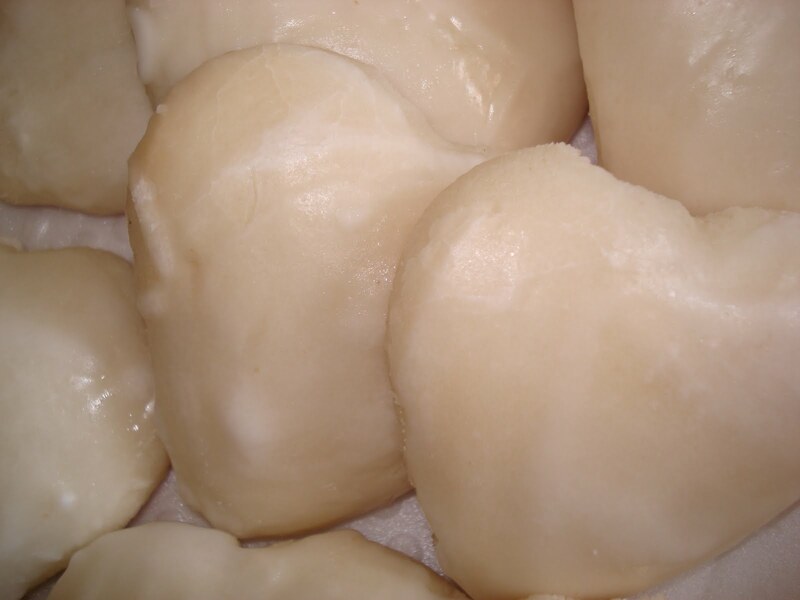 If you do not freeze. . process in a boiling water bath for 10 minutes. Makes 8 half pint jars. I was reminded again this week of the vast love of God. To realize that God infinitely cares for each detail of my life is so profound I can only praise and thank him for his never ending quest to be my friend. O Lord you have searched me and you know me. you know it completely O Lord. I thought about how God "hugs me". I have seen how God is faithful to meet me at my point of need. He truly does care for each person. he sees hearts . .
and he loves us still. The artisan bread was in the oven and called for some soup to go with it. Here's my version of Tuscany soup, adapted from an Alpha recipe. Saute onions, celery, carrots and garlic in oil in large pot. Add sausage slices and stir until meat is browned and veggies are tender. Add tomatoes, stock, kidney beans...along with seasonings. Bring to a boil....then reduce heat and simmer for 20 minutes. Stir in spinach and tortellini. Cook uncovered for 20 minutes or until pasta is done. Serve in individual bowls...sprinkled generously with shredded Parmesan cheese. * Use fresh basil and oregano instead of the dried herbs if available. 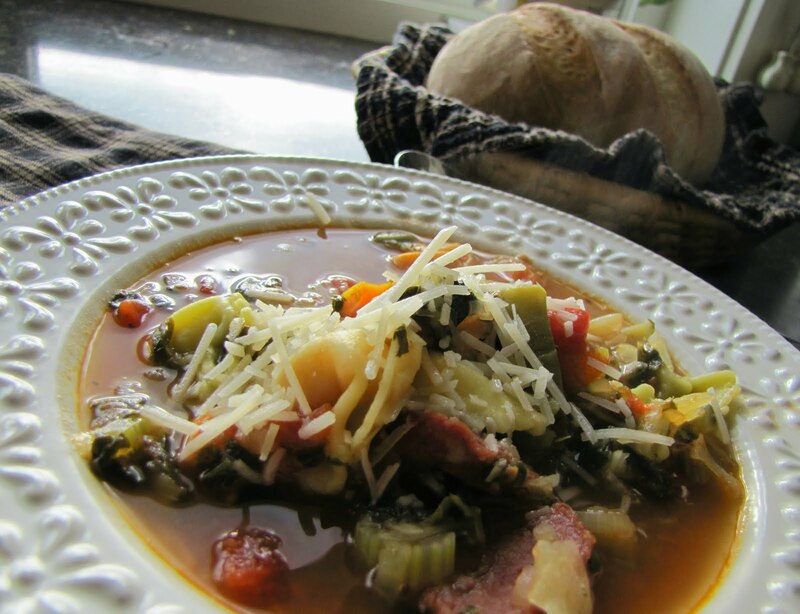 **Use the meat of your choice...ground beef works well in this soup. I've always liked this unusual bar. It's a cake like bar that is flecked with chocolate and has a delicious buttercream frosting. My friend Dorothy submitted this recipe to our first Greendale church cookbook. A bench scraper does a neat job of cutting these iced bars. Line a 9x13 inch pan with parchment paper or grease and flour the pan. Add sifted dry ingredients alternately with milk. Fold in grated chocolate and beaten egg whites. Bake in 350 degrees oven for 25 minutes or until inserted toothpick comes out clean. Beat together butter and egg yolks. Add icing sugar and beat until creamy. Working in the opposite direction, pull a knife tip through the rows of chocolate drizzle. Place bars in fridge until chocolate sets. Note: I refrigerate these bars because of the uncooked egg yolks in the frosting. Fresh rye bread piled high with thinly sliced deli corned beef, Swiss cheese, sauerkraut and a bit of Dijon mustard makes for a meal sized hot sandwich sure to satisfy your appetite. Lay out your bread on a cutting board and spread with mayonnaise and mustard. Divide and layer the meat, half the cheese well drained sauerkraut and then the remaining cheese onto one side of each sandwich. Top with the other piece of bread. Spread the outsides of both sides of sandwich for grilling. Heat a non stick fry pan on low to medium heat. A lower heat helps to melt the cheese and heat the sandwich through. Place the sandwich in the heated pan and allow to toast before flipping it to toast the other side. Variation: 'The Ruby Sandwich'...for those who don't like as much tang. Substitute ham and lightly dressed coleslaw for the corned beef and sauerkraut. The rhubarb season is upon us and here's one more delicious and nutritious way to enjoy your veggies. That's right...rhubarb is a vegetable, not a fruit. It is a good source of calcium with one cup of rhubarb juice having more calcium than one glass of milk. 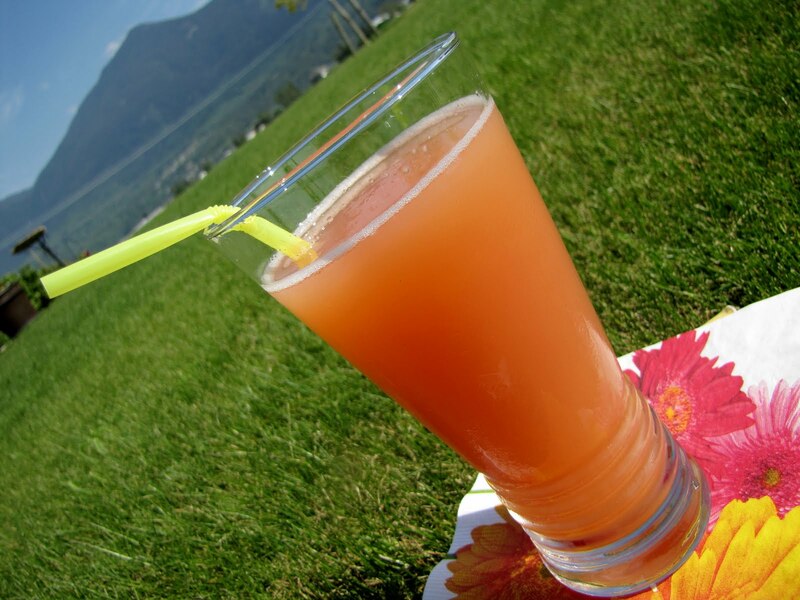 If you have more rhubarb at your disposal than you know what to do with, here is an excellent recipe for a rhubarb beverage. The recipe came from my extended family in the Okanagan Valley of British Columbia, where they grow rhubarb next to their apple orchard. In a large saucepan, bring rhubarb and 4 cups water to boil. Reduce heat; simmer, uncovered for 5-8 min. or until rhubarb is tender. Pour into a freezer container; cover and freeze until firm. Let stand at room temperature for about 30 minutes before before serving. Place equal amounts of slush mixture and club soda in each serving glass, or punch bowl. *I doubled the recipe in order to use a full can of each of the concentrates. While travelling in Europe, I was always fascinated by the small quaint churches in the Alps. Steeples and churches could be found around every corner. I stumbled upon this church, and found these words written on the front door. So many churches unfortunately looked abandoned. The beauty that surrounds us, is one significant piece of evidence that keeps us tuned in with God. Because of Jesus death on the cross, all believers today have personal access to God's presence everywhere and any time. It's wonderful to know...that I do not need to physically go to church to worship. I know I can worship him alone in my heart. But how much more wonderful when I can worship with others. I hope you can all find a place to worship with other believers. I love homemade bread and buns, and baking buns is very therapeutic for me. I usually add half whole wheat flour, but this time at the request of my kids, I didn't. This recipe makes a very light and airy bun. So good. Start with about 6 cups flour, add the yeast salt and sugar and stir together. Add the warm water, oil and vinegar. Stir together with a wooden spoon adding more flour till it is hard to stir. Add remaining flour a bit at a time till you have a soft, smooth and elastic dough that is no longer very sticky when kneading. Knead for a few minutes by hand on a floured surface. Let rest in greased and covered bowl in a warm place for about 40 minutes. I use my oven with the light on. Make into buns by either pinching off a piece of dough the size of an egg. Shape into a ball. Place it onto a 11 x 15 inch baking sheet about three buns across and 4 buns down. About an inch apart from each other. Let rise for another 40 minutes. Bake for about 20 minutes at 375 degrees. Watch your oven, temperatures vary. In the 1930’s there were two little boys, living in Russia, who loved to play together. Through difficult circumstances, they were separated when one of them, my dad, moved across the country and later across the ocean. My dad was a young adult when he found out that his friend, Abram - back in Russia, was really his half brother, having been given to an aunt when his mother died. (Even though the father remarried, his firstborn had stayed with the aunt while my father was born to the second wife. 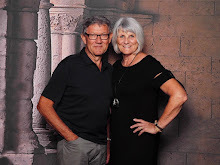 my Omi) Years later now, connecting with his half brother in any way was impossible, but in time they found each other and my dad began his mission to get him out of Russia. By a miracle this "uncle of mine," along with his family, arrived at Vancouver airport in 1978. I cannot explain in words, the emotions of such a re-union, one that requires getting to know each other, even though you are family. At first we had trouble communicating because of language barriers, but eventually they all learned English. I am so proud of my Tante Lena, who now so easily translated her recipe from Russian to English for me, as she read it to me. She is one of the bravest and most gracious women I know. 1 quart canned peaches along with syrup and 1 1/2 Tablespoons cornstarch. Prepare 11" flan pan by greasing, being careful to get into all the creases. Sprinkle with flour and tap to get it evenly all over. Using a wooden spoon, beat egg yolks and sugar until pale yellow. Stir in liquids and then combined dry ingredients. Beat egg whites with cream of tarter and gently fold into batter until just blended. Do not beat. Pour into prepared pan. Bake at 350° F for 25 minutes, or until a nice golden color. Allow to cool for 15 minutes. Pull away the edges gently by hand or slide a butter knife along the edges to make sure they come loose. Invert onto cooling rack. You may have to peek under the pan and gently slide the knife across part of it. If part of the cake remains in the pan, just gently loosen it and the sponge-like cake will easily patch up the spot. Allow to cool and fill with favorite fruit and top with glaze, following pkg directions. If using drained canned peaches, mix up 1 1/4 cups of the juice/syrup with cornstarch and heat, stirring until it comes to a boil. Cook, stirring a few minutes. Cool slightly and pour over fruit. Beat 1 cup whipping cream, adding 1 - 2 tsp sugar, until it begins to thicken and soft peaks form if beaters are raised. Do not over-beat. Spread on cake, forming soft peaks with back of spoon. I remember as a young girl pulling out long stocks of pink rhubarb from the garden, washing it and then asking for a little dish of sugar to dip it in. A wonderful treat. Rhubarb is the first fruit you can find coming up in the spring. If you have always wanted a rhubarb plant, but don't have the room in your yard, plant it in a big barrel or planter. I have had great success that way. Add lots of compost and you will have rhubarb to share. When I only have enough dough for a single crust pie, I add a crumble or meringue topping. There are many good pie crust recipes to choose from here on the blog. I use the one on the Tenderflake box. The nice thing with that recipe is it makes enough for a number of pies. I make the whole recipe, use what I want, divide the rest, flatten pieces into discs, wrap and freeze. When you need a pie crust all you do is thaw a disc roll it out and you are ready for another pie. Prepare and roll out pastry for a single crust pie. In a large bowl mix sugar, flour, and nutmeg together. Separate the eggs and add the yolks to sugar mixture. Using a fork blend together and then stir in rhubarb. Transfer rhubarb into the pastry shell and bake at 375º for 35-45 minutes. Beat room temperature egg whites until they begin to get frothy. Gradually add sugar, cream of tartar and vanilla and beat until mixture is thick and glossy. 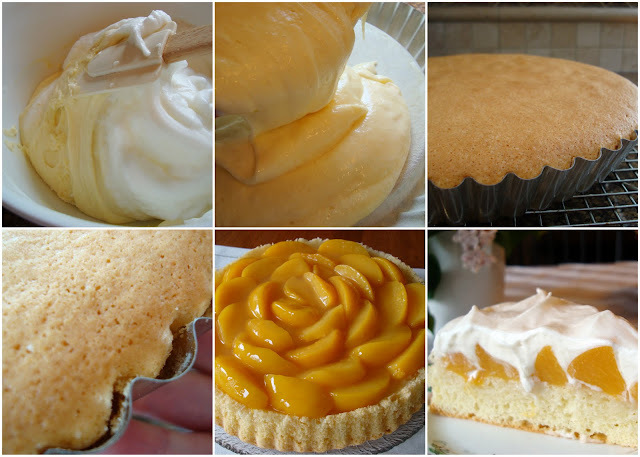 Once fruit pie is cooked, pile the meringue on top of hot fruit creating peeks with the back of a spoon. Return pie to oven and bake meringue until golden. About 8-10 minutes. Stay with it so it doesn't get too brown. Let egg whites stand at room temperature for 30 minutes before beating. This will allow for better volume. Make sure your bowl and beaters are clean and dry. Add the sugar gradually as soon as mixture begins to froth. To prevent the meringue from weeping, top the pie while it is still very hot. This helps the underside of the meringue to cook at the same rate as the top of it. With summer fruits filling the markets, it's easy and fun to make healthy meal choices. This hardly can be called a recipe, but it's a simple idea that dresses up a bowl of fruit. I used the hollowed out pineapple shells as bowls, but you can use other fruit shells or just a bowl. The glaze will keep the fruit from turning brown. -1 19oz (2 cups) can peach pie filling. In a large bowl cut up fruit and fold in the pie filling. 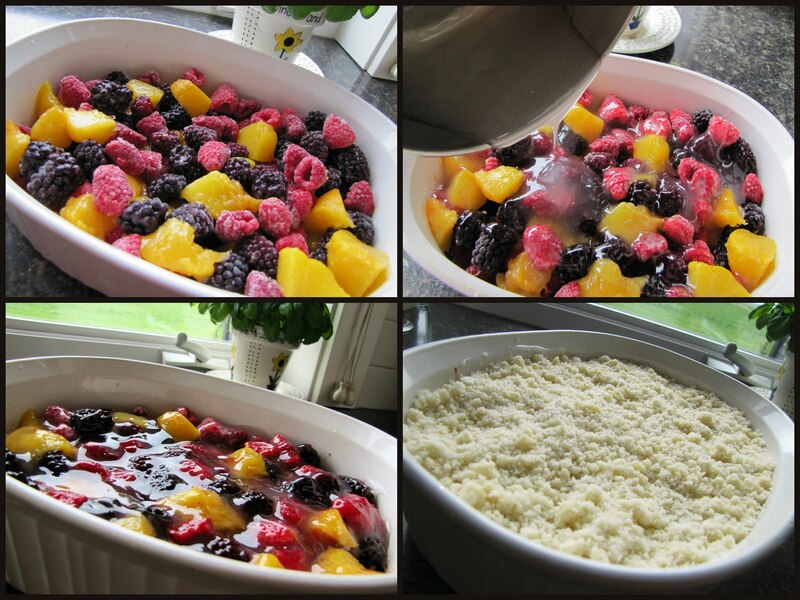 Transfer well coated fruit into your serving bowl and enjoy. Smoothies are a summer favorite here and as the fruits come into season the flavors change. They are quick and easy to whip up in a blender or in a food processor for a refreshing treat on a warm day. Pour into pretty glasses and serve. the following verses to her. and encourage them by choosing to spend time with them. and wants us to honour our parents. Happy Mothers' Day to each one of you. This is a recipe, adapted slightly, from one my mom made when she was baking for teen-agers and I did the same, usually doubling the recipe and mixing it in the large (Braun) mixing machine, using the hook attachment for mixing in the dry ingredients. Beat butter, adding sugar, eggs and vanilla, until well mixed. In a small bowl, mix dry ingredients together and then add to wet mixture, stirring until thoroughly mixed in. Add oatmeal, chocolate chips and almonds. Drop by tablespoons onto cookie sheet and bake at 350° F for 11 minutes or until barely golden in color. It's time for fresh salads from your garden or your local markets. This recipe has been in our family for the past 30 years. "Can't you make Opa's Dip?" My husband's father, who is 98...who was a farmer in the past, has also acquired some new skills in the kitchen. He loves to help Helen prepare the meals. This is a one-low fat recipe that he has made himself. We use this for vegetable dips or pour the dressing over your salad. I just made a fresh batch to serve with our fresh vegetables. Blend ingredients together with a whisk. Refrigerate and enjoy the blend of natural flavors. This recipe came to me compliments of my friend, Lenora. 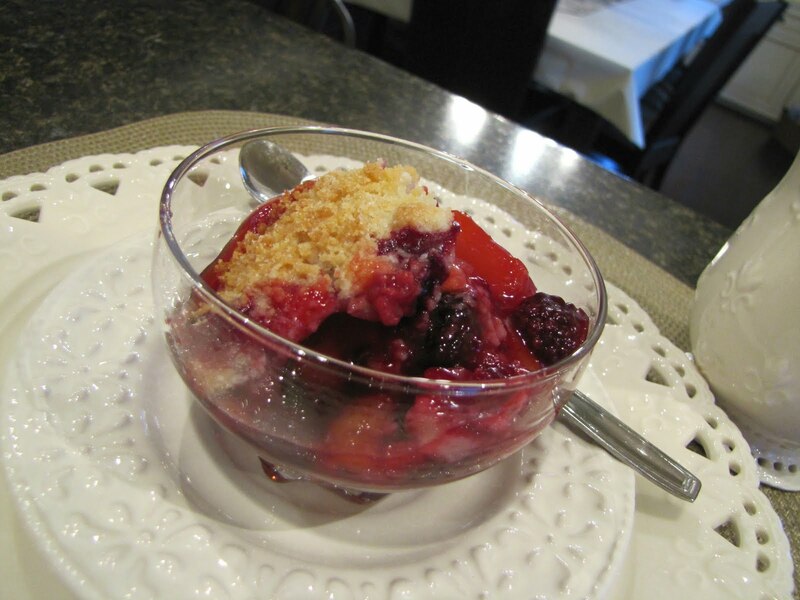 It's actually more of a cobbler than a crisp and most colourful, with the peaches and berries. I used blackberries and raspberries together with peaches since that is what is in the freezer. I've had it with a combination of peaches, cranberries and blueberries and it was equally good. Stir in beaten egg and mix well. In small saucepan, combine 1 cup sugar and cornstarch. Add water. Cook over medium heat until mixture thickens and boils. Remove from heat and stir in almond extract. 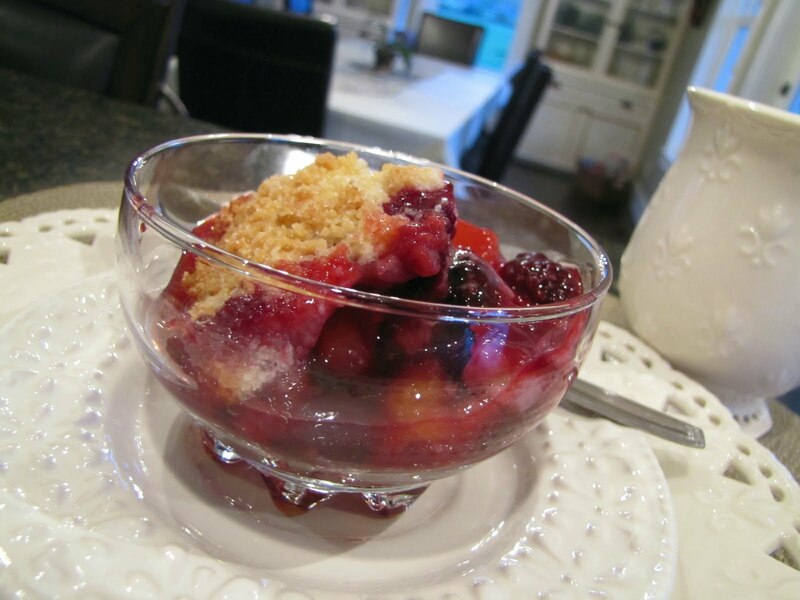 In ungreased 1 1/2 quart baking dish, combine peaches and berries. Bake at 400°F for 45 minutes or until golden brown. Serve warm...with whipped cream or ice-cream if desired. This is one of my father in law's recipes. In our early years of marriage my mother in law ran Murchies Tea Room in Victoria. Chef Vincent Parkinson was the chef and took this recipe that Dad shared with him, and served it in the restaurant. I'm sure Vince perfected the recipe with his expert culinary skills and taste, but Dad's original recipe is wonderful. In the menu at the tea house this was called Poached Eggs Oaklane. In a heavy skillet, melt butter and add chopped tomatoes. Cook over medium heat until tomatoes begin to cook down. Add the basil and continue to cook until tomatoes are very soft. Turn down and simmer for 20 minutes. Add salt and pepper to taste. Once the tomatoes are cooked down, crack eggs into the tomato basil mixture and poach to your desired likeness. While eggs are poaching place a lid over to help set the yolk. When the eggs are poached to your likeness, using a large flat spoon transfer onto toast. Serve with fried potatoes, bacon or sausages. This cake recipe comes from my friend Jan.
and is one of the first things I make with rhubarb each spring. It is similar to Lovella's Rhubarb Coffee Cake but is different enough to merrit its own post. In a medium bowl, mix rhubarb with jello powder. Set aside. Mix topping ingredients in another bowl. Set aside. In large mixer bowl, combine butter and sugar until fluffy. Add half of flour with salt, baking soda and baking powder. Mix well. Add remaining flour and mix just until blended. Sprinkle 1/2 of topping mixture evenly over rhubarb. Drop remaining cake batter in spoonfuls over rhubarb/sugar filling and spread evenly so that all of the rhubarb is covered. Sprinkle the remaining topping over cake batter. Bake at 350 degrees for about 35 minutes. Cake should be firm and nicely browned. Do not underbake. Serve warm or cold. Store leftover cake in refrigerator. *tip - if using an aluminum pan, line pan with parchment paper to avoid having the rhubarb discolour the pan. I use tart pans with removable bottoms instead of pie plates often for the ease of serving. A tart pan is perfect for tart or rich fillings when the flavour of your filling goes a long way. Rhubarb, lemon and rich chocolate are perfect for tarts. Tart pans are also easier to edge the pastry. All you do is press it over the edge and allow the excess to fall off over the side. If you want to make this tart for a larger group. .. use all the crust dough to fill a large cookie sheet with edges and double the filling and topping. You could half the recipe for the crust but it is very handy to have crust ready in the freezer and it only takes an hour or so to thaw on the counter. Put both the egg yolks in a 1 cup measuring cup . . give them a quick stir with a fork and then add enough milk to make 2/3 cup. In a food processor or large bowl, combine the flour and the salt. Add the cubed cold butter and pulse until large crumbs form or cut in butter with a pastry blender. Add the milk and egg mixture until combined. Use half the crust dough to roll out and line a 10 inch removable bottom tart pan. Wrap the remainder of the crust dough well in plastic wrap and seal in a heavy freezer bag and freeze for future use. . .unless you double the filling and topping recipe and bake it on a cookie sheet. 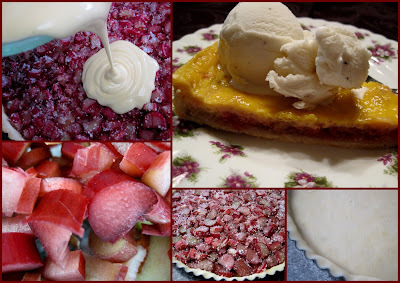 Combine the rhubarb, sugar and tapioca and arrange evenly over the crust. Cover lightly with some foil. Bake for 35 - 40 minutes or until the tapioca is nearly clear. While the filling is baking stir together the topping ingredients. Pour over the baked rhubarb filling and bake an additional 15 minutes or until set. If there are leftovers. . cover with a bit of plastic wrap and refrigerate. When we hear someone described as 'being in shape' we immediately have a mental picture of a slender, well toned body. The kind of body we would love to see reflected in our own mirrors. But those kind of bodies rarely come without some - and sometimes much - effort and discipline and training. it is much more important to be 'spiritually fit'. 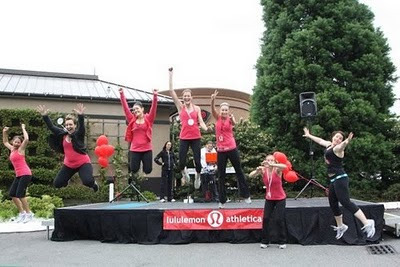 "For bodily exercise profits a little, but godliness is profitable for all things, having promise of this life that now is and of that which is to come." 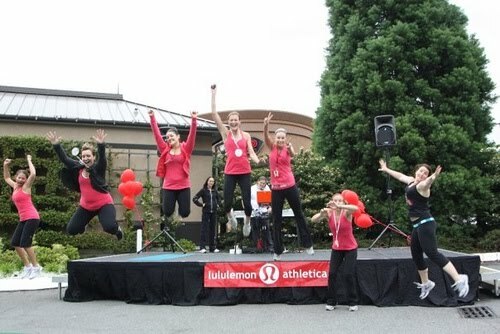 Do we put as much effort into getting into spiritual shape as we do our physical shape? What does a spiritually fit person look like ? until they are formed into the image of Christ. "But the fruit of the Spirit is love, joy, peace, longsuffering , kindness, goodness, faithfulness, gentleness, self-control. " What shape are we in? There is nothing as comforting as a good and hearty soup/chowder/stew. It welcomes family and friends around the table, with little effort or a big chunk of your grocery budget. When it is time to clean out the fridge before your next grocery shopping trip, you can create a new and interesting soup. Allow me to share how you too can create this delectable dish, when you thought you had nothing good to eat at home. First check what you have in your fridge, vegetables that look a little limpy, like carrot, celery, broccoli or cauliflower, you may not want to eat them as is, but for a soup it is just fine. What about a little left over roast beef/chicken or meatballs/spaghetti sauce. Rinse out your nearly empty bottles of ketchup or bbq sauce into the soup. Check your pantry. Do you have a can of beans, tomatoes, tomato sauce, vegetables. Perhaps a bag of pasta or rice that barely has enough in it to use as a meal. How about a can of soup that can really stretch to feed a family on. Use that as a base. It really isn't that complicated to create "something" from "nothing" and make your budget stretch. Years ago a women came and spoke to our mom's group at church about "hospitality" and her tip to us was to have a container in the freezer for those little left overs from a meal that isn't enough to keep as meal, like rice, pasta, meat, vegetables or what ever it is. So instead of dumping it in the garbage, or eating it because you don't want to waste it, place it in the container and when you have enough, add it to your soup pot at the end of the week. I have heard of this kind of soup referred to as garbage soup. But I refuse to call it that. I believe it is a privilege to have so much food in our country, that wwe even have leftovers. It should never be referred to as garbage. We should be wise with it, not wasteful and bless others with what we have, even we don't have a big food budget. Hence it is now called HOSPITALITY SOUP. I hope you refer to it that way as well. Our family enjoys soups and I make it every week. It is never the same, but always tasty and satisfying with a batch of biscuits or fresh bread, you are ready to call everyone to the table. This is just one of the soups that we have enjoyed. Remember if you don't have all the ingredients on hand that is OK, use what you have and be creative. You can make it your own, and use your imagination. This is what I did for the picture above. 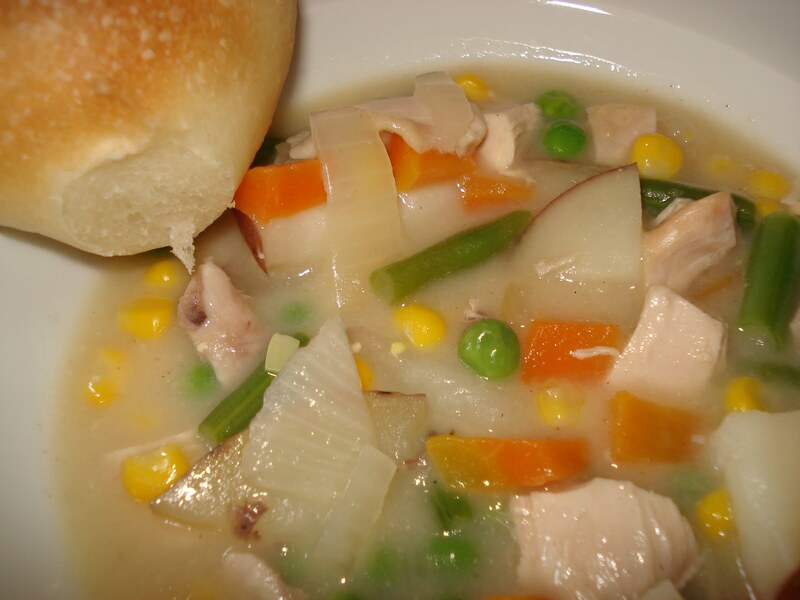 I call it a chicken/vegetable chowder. Chowders are often dairy based and a little thicker than a broth based soup. 2 cups of leftover chicken/turkey/or try ground chicken instead. I used leftover roast chicken. Chop up the bacon and cook until crisp. Drain all the fat. Add onions and celery and saute til soft. Mix the cornstarch or flour with the milk and whisk into the soup until smooth. Cook for a few more minutes until thick. Add frozen veggies, since they don't take much time to cook. Add Dijon mustard. Yup that is right, I had an almost empty container of it that wouldn't squeeze out any more, so I rinsed it in the soup. It was so good, now I intentionally add a tablespoon of it to soup. Pretty clever I thought, I love it. It doesn't taste like mustard but adds a nice depth of flavor. You never know what you can create with what is in your nearly empty fridge or pantry. Have fun creating, and let us know how it went.